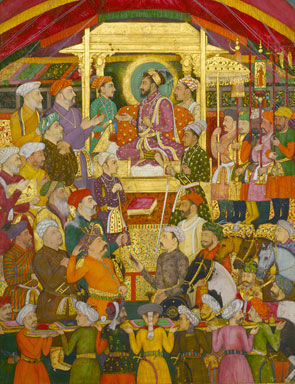 Shah Jahan Receives the Persian Ambassador, Muhammad Ali Beg. Folio from the Windsor Padshahnama, India, c. 1633. Ink, colors, and gold on paper. 12 5/8 x 8 5/8. The Royal Collection, Windsor. ©2011 Her Majesty Queen Elizabeth II. 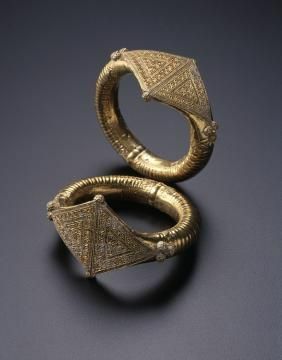 LOS ANGELES, CA.- The Los Angeles County Museum of Art (LACMA) presents Gifts of the Sultan: The Arts of Giving at the Islamic Courts, a major international loan exhibition, which explores Islamic art through the universal tradition of gift giving. 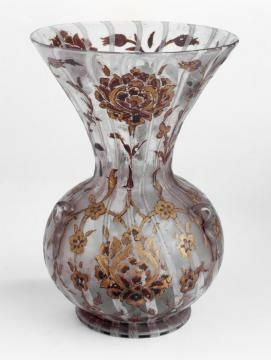 Many of the most spectacular and historically significant examples of Islamic art can be classified as gifts, a number of which have been brought together for the unique purpose of this exhibition to demonstrate the integral and complex nature of gift exchange in the Islamic world. Organized by LACMA with support from the Museum of Fine Arts, Houston (MFAH), Gifts of the Sultan spans the eighth through nineteenth centuries and features more than 250 works of art representing a rich variety of media from collections in America, Europe, and the Middle East. Following its presentation at LACMA (June 5-–September 5, 2011), Gifts of the Sultan travels to the MFAH (October 23, 2011-–January 15, 2012). Gift giving was a fundamental activity at the great Islamic courts for various purposes: to further diplomatic and political ambitions; as reward for services rendered; to celebrate annual events like the New Year or more personal occasions such as weddings and birthdays; and as expressions of piety, often associated with the construction or enhancement of religious monuments. Made of rare and precious materials and commissioned from the best artists and craftsmen of the day, these gifts came in many forms. Gifts of the Sultan brings together a brilliant array of diverse works including silk carpets and textiles woven with golden thread; jewelry and objects fashioned of precious metal; containers fashioned of jade, ivory, or rock crystal; elaborately illustrated manuscripts and richly illuminated Qur’ans; enameled and gilded glass; carved and inlaid wooden furnishings; and jewel-encrusted arms and armor. Gifts of the Sultan shows that many works were not straightforward gifts; rather their gift status is only revealed by unraveling their life stories, which tell how they were viewed or received, which was very often beyond the context of their original creation. The exhibition also demonstrates the cross-cultural interactions that took place between Islam and Byzantium, and with western European and East Asian courts, as the exchange of luxury objects illustrates a central process by which artistic forms and ideas were circulated, emulated, and assimilated. 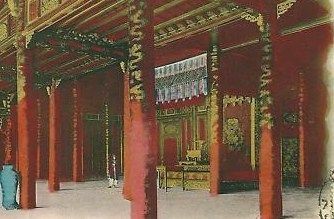 Gifts of the Sultan has been organized in three broad sections: personal gifts, pious donations, and state and diplomatic gifts. 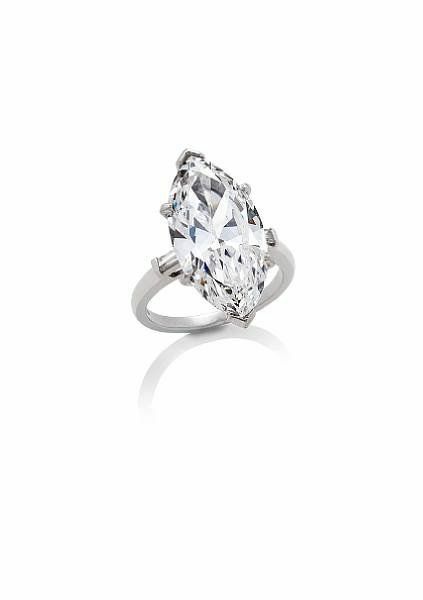 The first includes more intimate items such as objects of personal adornment in the form of jewelry, belts, and garments; precious yet utilitarian pieces such as vessels of gold, silver, porcelain, and jade; along with paintings, albums, and manuscripts. The second section highlights pious donations, encompassing architectural elements, furnishings, and manuscripts of the Qur’an that were part of a religious institution’s endowment, the endowment deed itself, and works, often of a secular nature, that were specifically gifted to a mosque or shrine. 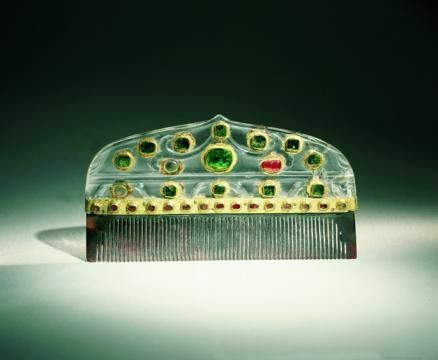 The third and largest section features works that were made for or kept in royal treasuries, representing a broad array of types and materials ranging from rock crystal pieces and courtly regalia to places of habitation such as a palace façade or a tent. A full-size silk and gold-embroidered Ottoman field tent presented to Catherine the Great from the Hermitage collection provides the focal point of this section. The exhibition also includes a small contemporary component presenting the work of Sadegh Tirafkan, Shahzia Sikander, and Ahmed Mater. These three innovative artists, who have roots in the Islamic world and draw inspiration from their own cultural traditions, have been commissioned to produce new work interpreting the theme of Gifts of the Sultan. Approximately fifteen objects from LACMA’s permanent collection are on view in the exhibition, such as the famed and rarely exhibited Ardabil Carpet (1539–40), which was a royal gift to the Safavid shrine at Ardabil, in northwestern Iran. Other key works of art drawn from international collections that are on display include two spectacular pairs of oversize gold bracelets from eleventh-century Syria that were perhaps dowry gifts; pages from a beautiful Mughal album, given by an Indian prince to his beloved wife; a group of enormous gold-embroidered textiles sent by Ottoman sultans to embellish the Ka`ba, in Mecca; and a fourteenth-century enameled and gilded glass mosque lamp, which was made for one of Cairo’s religious complexes but was subsequently gifted by the Khedive of Egypt to King Leopold of Belgium for the inauguration of the Suez Canal in 1869. 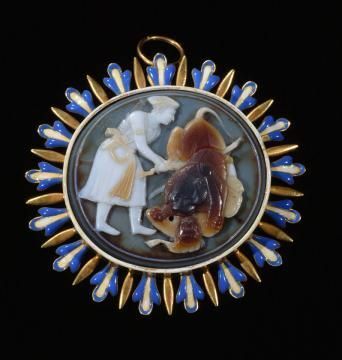 Cameo, India, 17th Century. Sardonyx with enameled gold setting, 2 5/8 x 2 7/8. Bibliotheque nationale de France, Cabinet de Medailles, Paris.